Almost every machine learning breakthrough you hear about (and most of what’s currently called “artificial intelligence”) is supervised learning; where you start with a curated and labeled data set. But another technique, reinforcement learning, is just starting to make its way out of the research lab. Reinforcement learning is where an agent learns by interacting with its environment. It isn’t told by a trainer what to do and it learns what actions to take to get the highest reward in the situation by trial and error, even when the reward isn’t obvious and immediate. It learns how to solve problems rather than being taught what solutions look like. Reinforcement learning is how DeepMind created the AlphaGo system that beat a high-ranking Go player (and has recently been winning online Go matches anonymously). It’s how University of California Berkeley’s BRETT robot learns how to move its hands and arms to perform physical tasks like stacking blocks or screwing the lid onto a bottle, in just three hours (or ten minutes if it’s told where the objects are that it’s going to work with, and where they need to end up). Developers at a hackathon built a smart trash can be called AutoTrash that used reinforcement learning to sort compostable and recyclable rubbish into the right compartments. Reinforcement learning is the reason Microsoft just bought Maluuba, which Microsoft plans to use it to aid in understanding natural language for search and chatbots, as a stepping stone to general intelligence. Commercial deployments are far rarer, though. In 2016, Google started using DeepMind’s reinforcement learning to save power in some of its data centers by learning how to optimize around 120 different settings like how the fans and cooling systems run, adding up to a 15 percent improvement in power usage efficiency. And without anyone really noticing, back in January 2016 Microsoft started using a very specific subset of reinforcement learning called contextual bandits to pick the personalized headlines for MSN.com; something multiple machine learning systems had failed to improve. The contextual bandit system increased clickthrough by 25 percent — and a few months later, Microsoft turned it into an open source Multiworld Testing Decision Service built on the Vowpal Wabbit machine learning system, that you can run on Azure. Microsoft’s John Langford discusses multiworld testing at QCon NYC last June. “We have a deployable system, which I think is the first anywhere in the world,” claims John Langford, the Microsoft researcher who started work on Vowpal Wabbit when he was at Yahoo. 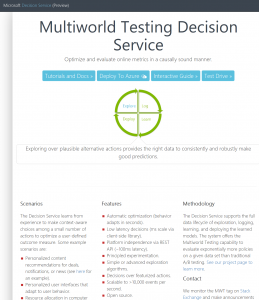 Multiworld testing runs multiple context-sensitive experiments at the same time and it lets you answer much more detailed questions than standard A/B testing. Contextual bandits are a mathematical representation of a slot machine with multiple arms, and before choosing which arm to pull each time the agent sees a feature vector showing the current context (from the multiworld testing), as well as the rewards for arms it’s played in the past. “The important thing to note is there is no long-term decision-making aspect,” further explained Alekh Agarwal of Microsoft Research, who also worked on the decision service. “It’s a sequential process where you observe some context and take an action and immediately get a reward; there’s no long-term reward to worry about. There’s still a limitation; if you take an action you only see the reward for that action, not what would have happened if you took another action. You’re trying to optimize your choice of actions given the contextual information you have.” That’s another way reinforcement learning differs from supervised learning, he notes. 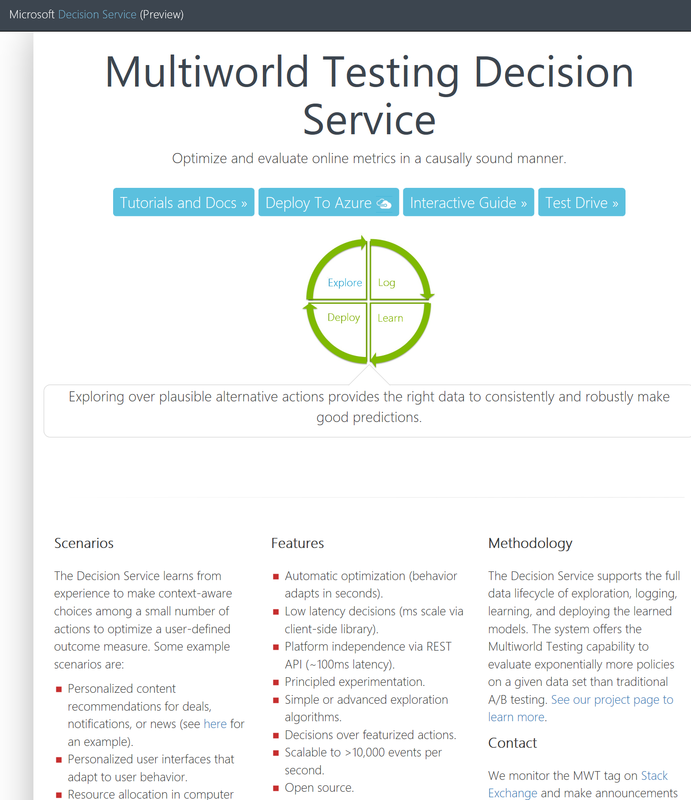 The Multiworld Decision Service is live and costs about 20 cents an hour to run on Azure (click to enlarge). There are problems where reinforcement learning is better than the better known supervised learning, though. “Right now there are a lot of problems people are trying to solve that don’t fit the supervised learning paradigm but they’re used to supervised learning so they try to use it,” Langford explained. “The canonical one is trying to predict clicks and optimize which ad you place.” Contextual bandits are ideal for that, and for making other personalized content recommendations. Unlike contextual bandits, there isn’t just one technique for imitation learning. There isn’t a standardized platform like the Multiworld Decision Service that you can use on your own problems. But we’re starting to get platforms to help researchers experiment. Games are a common way to train reinforcement learning systems because they have built-in rewards. Atari 2600 games have been a popular choice, but often they’re fairly simplistic environments. At the end of 2016, both Google and Open.AI announced that they were opening up their reinforcement learning training systems to researchers, giving far more people access to complex simulated environments for training AI agents previously reserved for companies with the budget to build them. Google’s DeepMind Lab — known internally as Labyrinth — looks like a simple 3-D game, with a floating orb representing the AI agent. 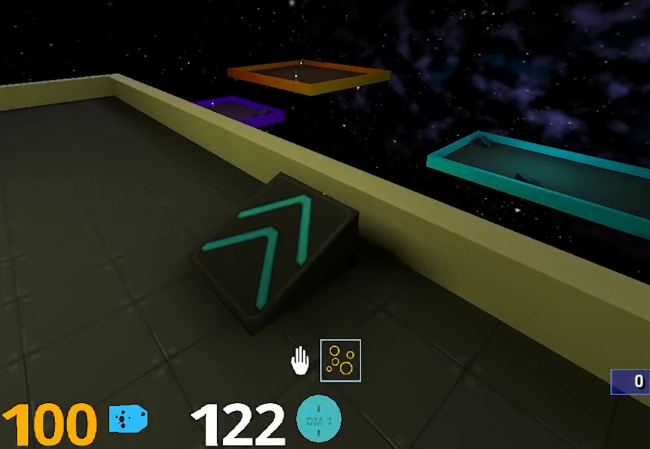 The world includes 14 levels and four kinds of learning tasks like navigating a maze (static or generated on the fly), playing laser tag and collecting fruit, but researchers can get the code for this virtual environment from GitHub, create their own levels (using a game editor or programmatically in C and Python) and experiment with different reward schemes and gameplay logic. The AI agent in DeepMind Lab is an orb that can view and navigate the 3D world (Photo: Google). 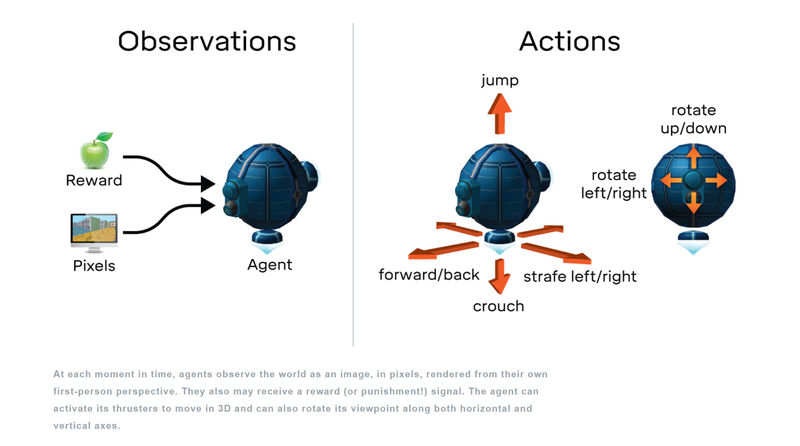 OpenAI’s Universe is also an experimentation platform for working on AI agents that try to learn to use computers the way humans do; by looking at the pixels on screen and operating virtual controls. As with Lab, the aim of Universe is to develop an AI agent that can not only learn to deal with one situation but use the learning techniques it’s developed to tackle unfamiliar environments as a stepping stone to creating AI that goes beyond a single, narrow domain — and OpenAI’s approach is to give researchers access to a lot of environments that were created for humans, not specially crafted for AI agents to learn in. Not only does that turn games and apps we already have into a training ground; it also means AI agents can watch people using the software to kick-start their learning — and we can compare the AI to human performance rather than just each other. Universe lets you use any program with OpenAI’s Gym toolkit for building reinforcement learning agents in frameworks like TensorFlow and Theano. Gym already included simulated robots, Go and a range of classic Atari games and Universe extends that to over a thousand environments, including Flash games, 80 common browser tasks like typing in a password or a booking a flight, and games like Grand Theft Auto V.
Universe packages them up as Docker images, launches them on a VNC remote desktop and controls them through Python scripts — although not all of them support reinforcement learning yet. OCR runs in the Python program that controls the Docker container to scrape the game scores to use as rewards; of the 1,000 Flash games, 100 have reward functions and OpenAI has plans to use human players to demonstrate more of the games to AI agents, to make it easier to analyze what the rewards should be. In the future, Universe AI agents will get access to games like Portal and Wing Commander III, as well as Wolfram Mathematica, and maybe Android and Unity games as well. They’re also going to be able to run inside Project Malmo, Microsoft’s reinforcement learning experimentation platform which runs on top of Minecraft (which it started work on in 2014 and open sourced in mid-2016). The two platforms have different research agendas. Project Malmo is about what Hofmann calls flexible learning. The OpenAI project has a rather different goal; they’re hoping to create a single AI agent with a generic problem-solving strategy, a first step towards general AI. Like so much of AI, reinforcement learning isn’t new; the first textbook covering it dates to 1998 (and the second edition will finally come out this year). What’s different now is partly that we have experience with some problems that are well understood, particularly in the two areas of contextual bandits and imitation learning. But we also need these new experimentation platforms like Universe and Project Malmo and DeepMind Lab to give more researchers access, and to compare solutions in the same environment to benchmark progress. Instead, researchers need a large, diverse set of environments that’s also standardized so everyone in the field works against them. “Flexible, diverse platforms can serve the same function as a repository for reinforcement learning tasks where we can evaluate and iterate on ideas coming out of research much faster than was possible in the past, when we had to restrict the algorithms to simple evaluation problems because more complex ones weren’t available. Now we can take ideas to the platforms and see whether or not they do a good job,” Agarwal said. Reinforcement learning will often be only one of the machine learning strategies in a solution. Even AlphaGo was initially trained to mimic human play using deep learning and a database of around 30 million moves from 160,000 games played by human Go masters. It was only once it reached a certain level of skill that it began playing against other instances of AlphaGo and using reinforcement learning to improve. That pattern might actually be key to making reinforcement learning ready for wider use, Hofmann suggested — either by using deep learning to prepare the actions and rewards for a reinforcement learning system, or by using reinforcement learning to reduce the work it takes to apply supervised learning to a domain. “At the moment, if you put a reinforcement learning agent in a 3-D environment they would reason at the granularity of individual abstraction, taking one step forward, not on a higher level using the concept of walking to the next door. 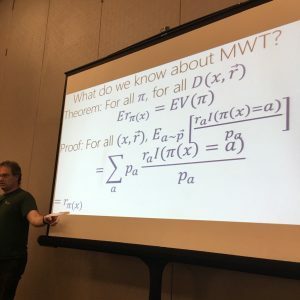 There are questions about abstraction that still need to be addressed before we can put the next pieces of reinforcement learning into applications, like understanding how to set goals in situations where a clean scoring function might not be available,” Hofmann explained. There is still plenty of research to be done, like how to get agents to explore their environment systematically, giving them the equivalent of curiosity or the intrinsic motivation to explore. And there’s also the problem that few developers are familiar with reinforcement learning at this point. It’s likely that systems like the Multiworld Decision Service will help bring reinforcement learning to a broader developer audience, Agarwal suggested. One of the differences between supervised learning and reinforcement learning is that in the supervised learning world it’s usually a machine learning person providing the algorithm and the user bringing the data. “In reinforcement learning, it’s more that you bring your domain to the table and the agent by acting in the world is creating its own data. That creates a lot of complexity; the app developer has to build a lot more pieces of the solution if they want an algorithm to work in the right way and there are many things that can go wrong. It’s often better to design a whole system,” Agarwal suggested. Feature image: Laser tag levels in DeepMind Lab test agents on fine control, strategy, planning and dealing with a complex visual environment. Image from Google.